In honor of National Hispanic Heritage Month, Pura Vida Worldly Art is sprucing up its gallery shop with Many Backgrounds: One American Spirit. The exhibit, a fiesta for the eyes of sorts, is comprised of artwork by a handful of Charlotte’s most talented Hispanic American artists. National Hispanic Heritage Month, an annual celebration that kicked off on Sept. 15 and runs through Oct. 15, began in 1968. It helps to remind folks of the diversity and rich contributions made to society by Americans with lineage stemming from Spain, Mexico, the Caribbean and Central and South America. 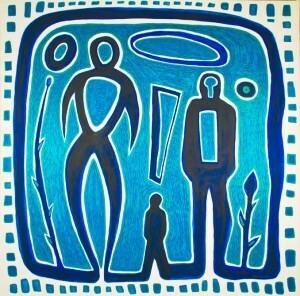 Pura Vida’s Many Backgrounds showcases works by four artists: Luis German Ardila, Rogelio Calvo, Rosalia Torres Weiner, and Nico Amortegui. * Rosalia Torres Weiner, the founder of Project Art Aid (a nonprofit organization helping to promote art in the Hispanic community, see: www.projectartaid.org) is influenced by her Mexican origins. 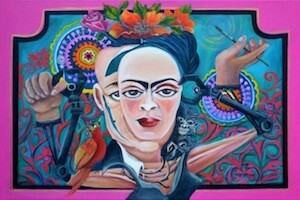 Her zesty collection of solid, colorful paintings portray renowned surrealist artists like Frida Kahlo and Salvador Dali. * Colombia-native Luis German Ardila, has taught art for more than 20 years and is inspired by artists Diego Velazquez and Pablo Picasso, as well as the iconography of European cathedrals and castles of the Middle Ages. Ardila's "Red and Gold Fish"
* Rogelio Calvo, a native of Panama, muses over indigenous designs and patterns found on tapestries from Latin American countries. 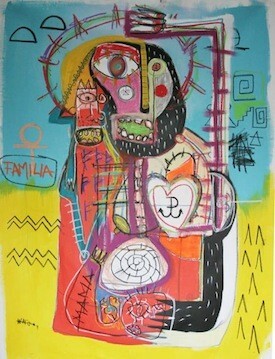 His acrylic painting "La Familia/The Family" is a fine example of the result. Exhibit opens with a reception on Friday, Sept. 28, from 6 p.m.-10 p.m. Free admission. Gallery hours: Tuesday-Thursday, 10 a.m.-2 p.m., 4 p.m.-6 p.m.; Friday, 11 a.m.-2 p.m., 4 p.m.-8 p.m.; Saturday, 11 a.m.-8 p.m.; Sunday, 12 p.m.-4 p.m. Continues through Nov. 3. Pura Vida Worldly Art, 3202 N. Davidson St., Suite A. 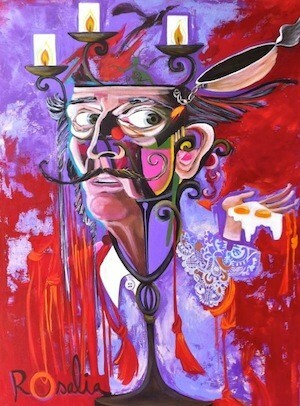 704-335-8587. www.puravidaart.com.